James Gillray (1756-1815) was one of the greatest caricaturists of the 18th century. From around 1775 until 1810, he produced nearly 1,000 prints—including brilliantly finished portrait caricatures of the rich, famous, or frivolous, wonderfully comic caricatures of people being awkward, and unquestionably the best satiric caricatures of British political and social life in the age of Napoleon. His preeminence in graphic satire, especially in the 1790s made him both sought after and feared. No sooner did a new Gillray print appear than it was sure to be plagiarized or imitated by contemporaries both in England and abroad. And even today, there are few political cartoonists who would not admit to some debt to Gillray’s work. 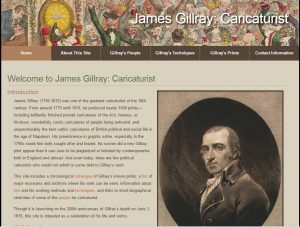 For those interested in the development of English caricature and especially the prints of James Gillray, I have created a web site you can visit for a comprehensive overview of his work–James Gillray: Caricaturist. The site includes, first and foremost, a chronological listing of his known prints–both satiric and otherwise. But it also contains a list of major museums and archives where his work can be seen, information about Gillray’s life, working methods, and techniques, and links to short biographical sketches of many of the people he caricatured. Here is the background. A couple of years ago, I decided to return to a book I had long since planned to write on the development of 18th-century caricature. But, of course, anyone hoping to talk about caricature must confront the monumental presence of James Gillray. So I began to look carefully at Gillray and his own development as a caricaturist. I was soon frustrated, however, by the lack of a comprehensive and chronological catalog of his work. Most of the books devoted to Gillray offer only a selection of his work, or, like Thomas Wright and Dorothy George, divide his work into political or satirical prints and social, personal, and miscellaneous prints. And none of them include the prints Gillray created in his bid to be recognized as a “serious” artist and engraver. I wanted to see Gillray’s work as he saw it, as a day by day effort at making a living and honing his craft. Using the British Museum Catalog as a point of reference, I began doing searches of major Gillray archives online and visiting some of the non-digitized collections near my home in central New Jersey. I will spare you the tales of my additional frustration while searching online for prints whose spelling and punctuation are highly idiosyncratic, and whose dates are sometimes difficult to decipher even up close. Needless to say, I discovered that search results are only as good (or bad) as the very human process of cataloging the prints in the first place. And I came away with a deep respect and appreciation for the heroic efforts of the staffs at the British Museum, National Portrait Gallery, Lewis Walpole Library, and other institutions who have made it immeasurably easier (though still challenging) for someone like me to come along and build upon their work. The first result of my efforts, then, was a spreadsheet of over 900 rows containing a chronological listing of the prints and at least some of the collections where they could be found. After months of labor, I realized I had only arrived at a starting point. I could now begin to look at and think about Gillray’s development as an artist. And that’s when I thought: no one should have to go through this again. And that’s when I also realized that I should make a website so that people could easily see what I was seeing–the wonderful artistry of James Gillray. It was a natural enough thought for me. I spent most of my life outside of academics at a major technology company, AT&T Labs (the successor of Bell Labs). And the last part of my career there was managing a website design and development group. Thinking in terms of web publishing, then, was almost second nature to me. So I began to design a website around the idea: what would I want to see and know if I were trying to get acquainted with Gillray and his work? And that is still the guiding principle of James Gillray: Caricaturist. I launched the site on the 200th anniversary of Gillray’s death on June 1st, 2015, and its basic design has not changed. But right now I have a goal of providing commentaries on at least a representative sample of the 900+ prints Gillray created over the course of his career. About 50 are now up on the site, and I am continuing to add more. If you wish to be alerted when I add more commentaries or make a substantive change to the site, I have included a form to subscribe to updates on my contact page. I welcome feedback, corrections, and suggestions, and I have provided my email address on the same page. This entry was posted in Collections, Digital Humanities and 18th-Century Studies and tagged Art, digital humanities, Politics, print. Bookmark the permalink. Jim Sherry got his PhD from the Johns Hopkins University with a dissertation on Jane Austen. He has written and/or published articles on Austen, Virginia Woolf, Tennyson, Thomas Patch, Thomas Rowlandson, and caricature as a genre. He taught at Barnard College for four years before joining AT&T where he spent most of working career, initially as a technical writer and later as the manager of publications and web site design and development groups. He thinks of himself primarily as a writer, and has created occasional political satire as well as screenplays based on The Awakening, To the Lighthouse, and Lady Susan.